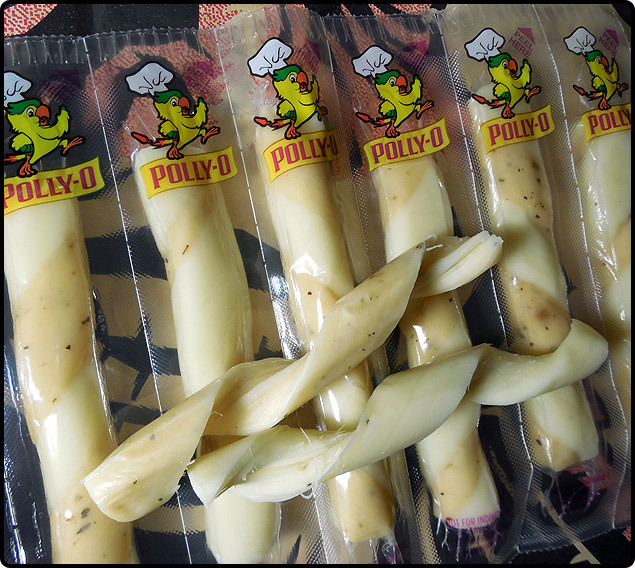 Polly-O Pizzeria String Cheese. | Dinosaur Dracula! Today’s youth may take string cheese for granted, but me? No way. Never. I knew a world without string cheese, and it was as black as tar. 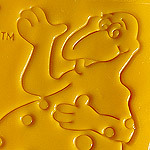 Polly-O String Cheese came out when I was still in elementary school, and while I’m not motivated enough to do the math, that was, suffice to say, a very long freakin’ time ago. It was immediately popular, and the only kids who went a day without string cheese were the ones who couldn’t eat dairy without it turning their guts into a fireworks show. 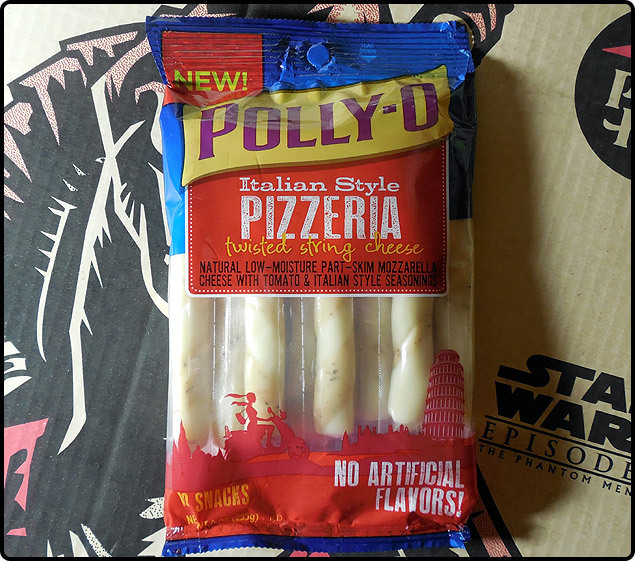 …and it’s those memories that made Polly-O’s new “Pizzeria” string cheese such a big deal for me. I see this, and I’m back in the second grade. 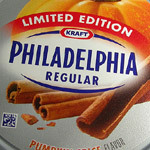 There are other “odd” flavors available these days, from jalapeno to black pepper, but this one – the one that tastes like a pizzeria – is the string cheese that makes me want to eat from within a hut fashioned out of couch cushions. Formally, the flavor title is Italian Style Pizzeria Twisted String Cheese. 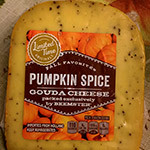 It should not take ELEVEN syllables to describe cheese, and so we will never mention the formal title again. Guys, there’s a really good reason to buy this string cheese. The smell. 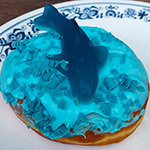 They smell like junk foods that no longer exist. 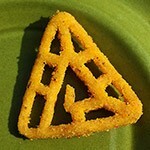 Things like Crunchabungas and Keebler Pizzarias. 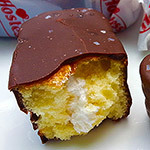 When I unwrapped the first one, I just kind of sat there for a moment, halfway entranced. They have an extremely distinct smell that you will immediately recognize, but trust me, you have not smelled THIS EXACT SMELL in more than ten years. It’s a mindfuck, or maybe a nosefuck. And it alone is worth the price. As for the taste? Pretty good, yo. The seasonings are much lighter than the odor suggests, but these do sort of taste like “pizza cheese.” Cold pizza cheese with nearly invisible tomato bits, but pizza cheese all the same. They only come in that newer “twisted” style, which I am no big fan of. I prefer traditional string cheese, the kind that you separate strand by strand, in a process that’s no faster and in fact very similar to delousing a hairy gorilla. 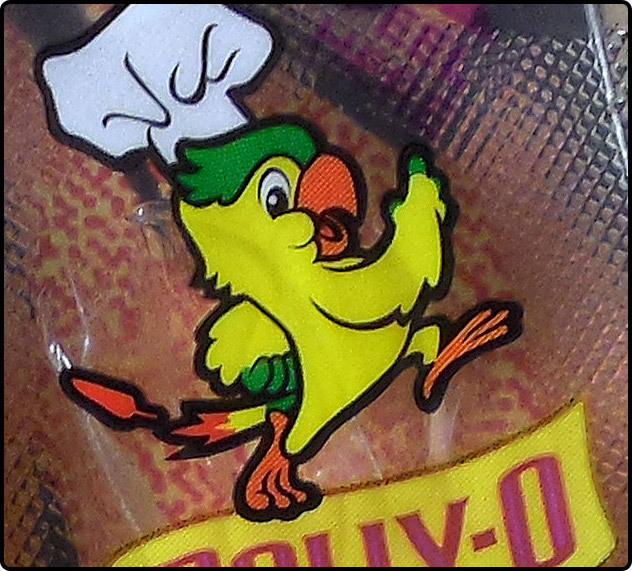 Polly-O wants you to think that you can still do that with “twisted” string cheese, but you can’t. You can’t do it correctly, anyway. But I’ll forgive them for that, because THEY BROUGHT THE BIRD BACK. Him. That bird. He went away for a while, right? I cannot express how happy I am to see this parrot-in-a-hat again. I can’t look at him and avoid a smile, even if it’s only because he’s smiling. If there’s one quirk I wish I could kick, it’s my seeming obligation to mimic cartoon birds. Food reviews are incomplete without grades. So, B+ I guess.